bearing oil coolers - HEXECO, Inc.
HEXECO, Inc., founded in 1976, is a privately-held corporation specializing in the design and manufacture of bearing oil coolers. Our immersion coolers provide long-term cooling solutions for generators and motors with uniform oil cooling directly within the oil reservoir. Coolers are supplied for new generators and motors and also to upgrade cooling performance in existing equipment. HEXECO, Inc. can replace worn out, old style coil designs with new equipment using materials and heat transfer surfaces better suited for existing site conditions. HEXECO, Inc. also designs special exchangers for operating conditions or heat transfer requirements not easily handled by standard heat exchanger designs available from others. Equipment may be manufactured in accordance with the requirements of ASME Code Section VIII Division I, and stamped. Test procedures include dye penetrant, hydrostatic and helium. 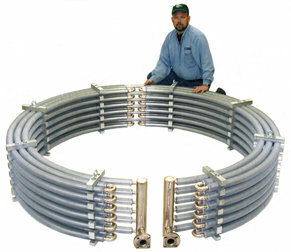 Certain types of repair and replacement services are also available for a select variety of heat exchanger designs. Repairs and/or alterations may be in accordance with the applicable rules of the National Board Inspection Code, and stamped. * End - User Inquiry Info.